Fukushima Government Promotes ‘Safe’ Fukushima Milk For School Lunches! 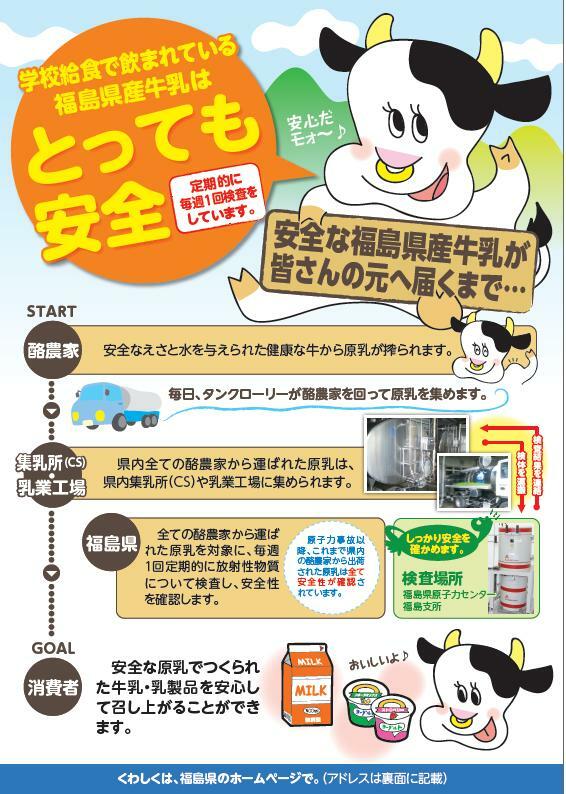 For your weekend entertainment, here’s the promotional pamphlet by the Fukushima prefectural government telling the consumers it is so safe to drink Fukushima milk in school lunches. It uses the word “safe” so many times that many suspect they have something to hide, while others are simply scared of the cow in the pamphlet. On the second page, it brags that no radioactive materials have been detected in milk in Fukushima since April 25, 2011. In fine print, it says the detection limit is 5 becquerels/kg, but just above that line it also says “ND means the level is so low that the equipment cannot even measure”. The equipment in Fukushima Prefecture may not be able to measure, but in other prefectures they have no problem measuring radioactive cesium in milk to one decimal point. Remember in Fukushima that some school teachers excoriate students who are reluctant to drink milk in school lunches in front of the class, telling them they are “unpatriotic”. I’ve heard similar anecdotal stories about wearing masks to school. Some teachers berate students wearing masks and order them to take the masks off. I’m sure it is just a baseless rumor. They wouldn’t do such a thing, teachers, would they?